AS A rule, when a new model gets its first update, changes are largely cosmetic. 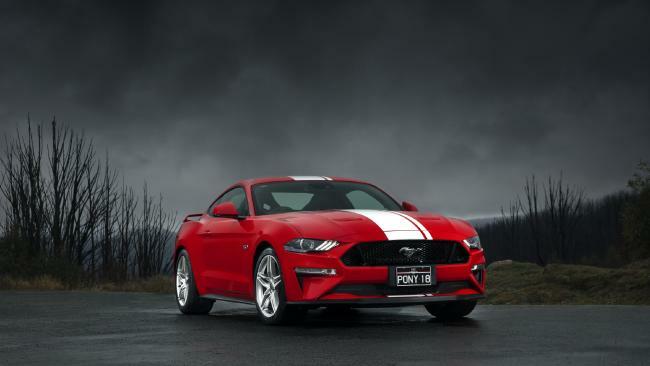 Ford has taken a different approach with the Mustang, a roaring success since its launch in 2015, especially in right-hand drive markets such as Australia where 'Stang fans at long last got their hands on the pure factory product. The changes to the 2018 model are comprehensive and focused on engineering. This is much more than a facelift. It's all about keeping Mustang competitive with its US rivals, the Chevy Camaro and Dodge Challenger. Winning the hearts and minds of America's petrolheads is serious business and the contest is very hard fought. 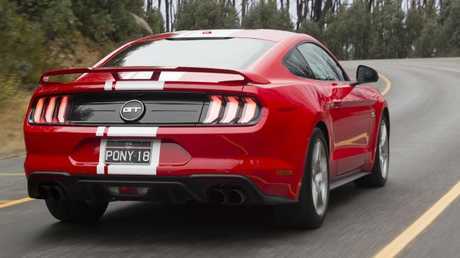 The Mustang GT's 5.0-litre naturally aspirated Coyote V8 gains new port and direct fuel injection, larger valves and a higher compression ratio, raising outputs to 339kW/556Nm (respective increases of 33kW and 26Nm). It now spins 500rpm higher, to 7500rpm - furious revs for a V8 of such large capacity. A new 10-speed automatic transmission replaces the previous model's six-speed. There's still a limited-slip differential at the other end of the driveshaft, the rear suspension is more securely located (adaptive dampers are optional) and stiffer stabilisers at each end sharpen the car's reflexes in corners. A new valved exhaust, with four selectable volume levels, is standard. The loudest noise I've ever heard was the late Billy Thorpe's guitar, at Sydney's Hordern Pavilion, circa 1973 - in Racetrack mode, wide open with the pedal on the floor, the Mustang's pipes sound similarly, shatteringly, wonderful. 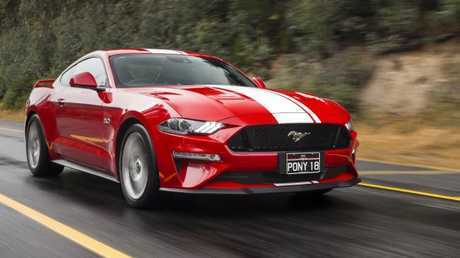 The GT Fastback with six-speed manual is $62,990, the 10-speed auto is $65,990 and the GT convertible auto is $74,338. Our test Fastback adds the adaptive dampers ($2750), spoiler ($750), 19-inch forged alloys ($2500), Recaro seats ($3000) and a set of Over The Top body stripes - as you would - at $650. Total spend, before on roads: $75,640. Not cheap but a bargain nonetheless. The seats - faux race shell, leather-wrapped Recaros - provide luxurious comfort on long drives and complete support when cornering. A tall driver might feel perched on the 2018 Mustang rather than seated in it, though, a sensation amplified by the lower, de-bulged bonnet. You face a new, all-digital 12.4-inch dash, in a conventional twin barrel housing, with four selectable instrument displays. Ford's infotainment touchscreen is still buried low on the dash for maximum distraction and inconvenience while driving. You can use stand-alone voice for most tasks or connect your phone via Apple CarPlay or Android Auto. The Mustang rides like a true GT. Adaptive suspension, though firm, absorbs bumps quietly and efficiently, even on the sportier settings, aided by a change from Pirelli to more compliant Michelin tyres. The 2015 model scored a poor two-star ANCAP rating. This one, though structurally unchanged, gets three stars - still sub-par, with rear passengers particularly vulnerable to injury. Standard are autonomous emergency braking with pedestrian detection (and injury mitigation via an auto-lifting bonnet), lane keep assist and adaptive cruise control. 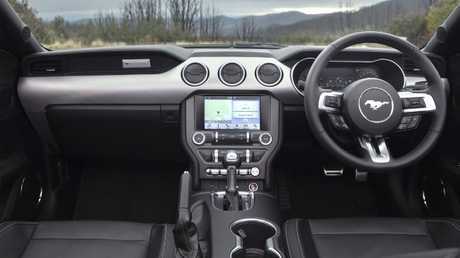 Ford has obviously given the GT's transmission electronics a huge boost in processing power, because the 10-speed automatic works efficiently and intuitively with the 5.0-litre V8. Closely spaced lower ratios allow the V8 to mimic a turbo's bottom-end flexibility and it will pull 10th gear at 100km/h ticking over at 1650rpm. At the other end of the tacho, from 5000rpm and up, performance is explosive, supremely responsive and rocket quick - its claimed 4.3 seconds from 0-100km/h is half a second quicker than the previous model with the six-speed auto. Seat of the pants says that's pretty accurate. Under pressure in Sport+ mode, the 10-speed picks ratios with near faultless timing and impressive smoothness considering the massive torque involved. Paddle-shifters are also provided. Pre-programmed modes covering engine, transmission, steering, suspension and exhaust range from Normal to Dragstrip, or you can mix and match to make your own "My Mode" - select the pony button on the steering wheel. Fuel consumption is horrific, of course, and you can empty the 61L tank in under 300km. Expect 20L/100km or so in town, and about half that on the highway. Mustang is still a big, heavy (1784kg) car but it now drives with Germanic tautness rather than the usual American sloth. It points immediately and accurately into a corner, assisted by sharp, tactile steering and wide (255/40) front rubber. The body stays flat and well-balanced when changing direction and it's communicative and controllable under power. Six-piston front Brembo brake calipers, on 380mm discs, pull it up with authority - you could have lots of fun with this at a track. The Mustang was the car of my dreams when I was a kid. Now, I can afford one. Mad if I don't. This is the cheapest ticket in town to The Engine From Heaven and it comes in a package now able to do justice to its performance. HSV is doing the right-hand drive conversion in Melbourne. Runs a 6.2-litre V8/eight-speed auto, with 330kW/600Nm. On sale shortly, with a predicted $80K-$90K pricetag. 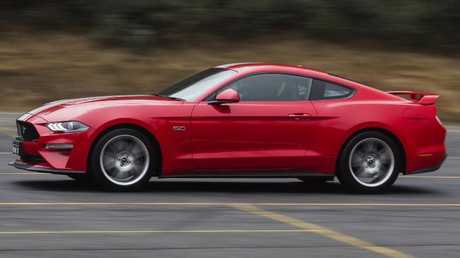 No longer just a big, boofy, loveable muscle car, the Mustang GT is now a sophisticated performance machine, a much sharper, sportier drive and even better value for money.